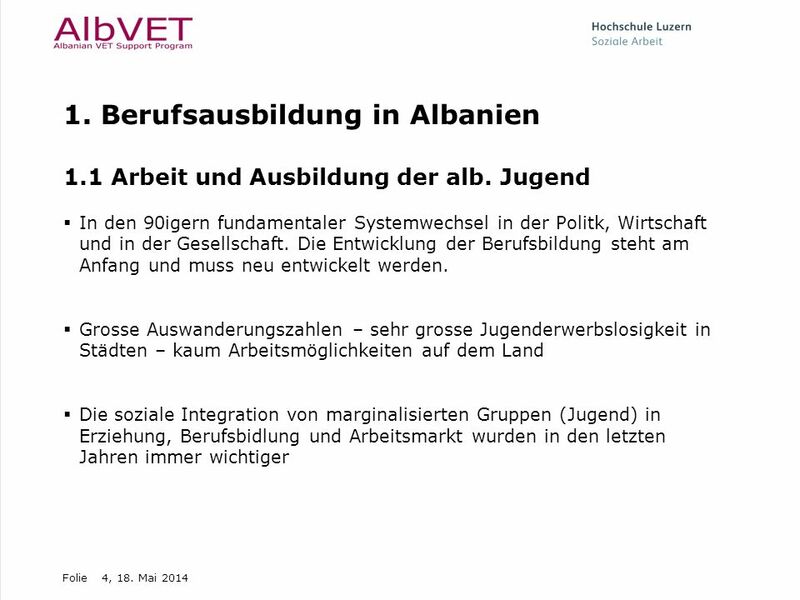 1.1 Arbeit und Ausbildung der alb. Jugend In den 90igern fundamentaler Systemwechsel in der Politk, Wirtschaft und in der Gesellschaft. Die Entwicklung der Berufsbildung steht am Anfang und muss neu entwickelt werden. Grosse Auswanderungszahlen – sehr grosse Jugenderwerbslosigkeit in Städten – kaum Arbeitsmöglichkeiten auf dem Land Die soziale Integration von marginalisierten Gruppen (Jugend) in Erziehung, Berufsbidlung und Arbeitsmarkt wurden in den letzten Jahren immer wichtiger Albania is undergoing fundamental changes and reforms in many areas. The country aims at moving towards European integration, but it has a long way to go politically, economically and socially. Albania is still one of the poorest countries where the opportunities of the youth to find a gainful employment are limited. Vocational Education and Training (VET) is one of the areas that require most efforts and support. At the same time, professional training has considerable potential to boost the economy and to make a significant contribution to insert people into the labour market. Following this, over the past 15 years, Albania has experienced one of the highest emigration rates. The equivalent of 40 per cent of the working-age population is estimated to work abroad. Approximately 60 per cent of migrant workers are aged at the time of migration. The absence of decent work opportunities and the hope of a better future are the main factors of motivation for youth to migrate internally or abroad. The recent high GDP-growth rate, also due to the inflow of remittances, has not translated into employment creation. Youth from urban areas are twice more likely to be unemployed than adults. Unemployment, however, is a less-affordable option for people living in rural areas, where most young workers have to accept any job, including underemployment and informal employment. Work with meager earnings and poor working conditions in the informal economy, especially in agriculture, is just the hallway to migration. Empirical analyses concur that many young workers keep informal employment with the hope of finding a chance to improve their working and living conditions through labour migration. In the course of its economic growth and the decreasing poverty level the issue of inclusion of special young groups has become increasingly important for Albania. Without negating the overall challenges Albania is facing, both in regards to the labour market and to the vocational education and training (VET) system it is widely acknowledged that individuals from certain groups are facing particular challenges and disadvantages due to their economic, social and cultural situation. 5 1.2 Ausgegrenzte Gruppen Albanien hat mehrheitlich die internationalen Verträge der menschenrechte ratifiziert und unterschrieben. 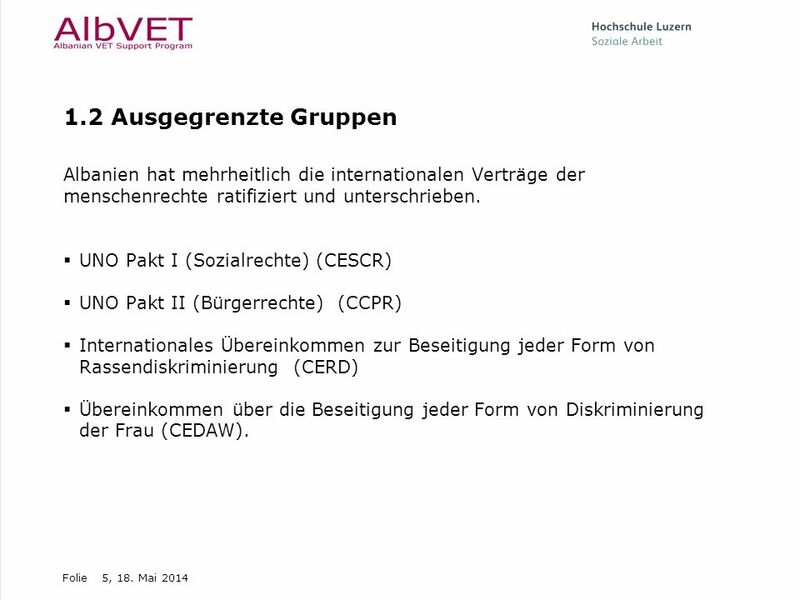 UNO Pakt I (Sozialrechte) (CESCR) UNO Pakt II (Bürgerrechte) (CCPR) Internationales Übereinkommen zur Beseitigung jeder Form von Rassendiskriminierung (CERD) Übereinkommen über die Beseitigung jeder Form von Diskriminierung der Frau (CEDAW). In recent years Albania has moved considerable steps forwards in acknowledging the importance of social protection and inclusion with a specific focus on special need groups. On the one hand Albania has signed and ratified most of the major international human rights treaties. On an international level, this obliges Albania to take the necessary measures to ensure compliance with these treaties including adaptation of its national legislation and setting up of appropriate monitoring mechanisms. In particular this includes the International Covenant on Economic, social and Cultural Rights (CESCR), the International Covenant on Civil and Political Rights (CCPR), the International Convention on the Elimination of All Forms of Racial Discrimination (CERD) and the Convention on the Elimination of All Forms of Discrimination against Women (CEDAW). 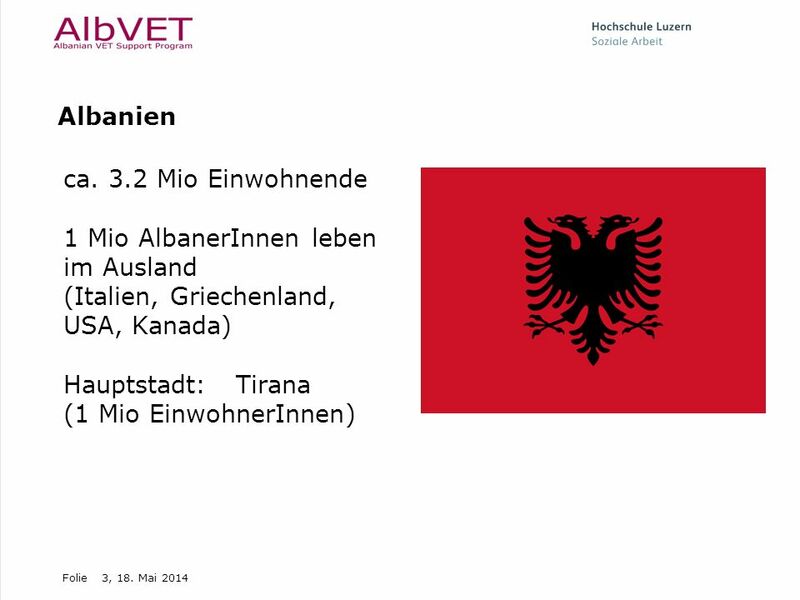 Groups whose individuals are most likely to miss out on VET in Albania include school drop outs, school leaving youth, people from remote areas, orphans, Roma and Egyptians, people with disabilities, trafficked people and people at risk of being trafficked as well as women in vulnerable situation such as single mothers, divorced women and widows. As mentioned above, individuals from those groups often face multiple disadvantages in various issues. Those issues can among others be related to education, income, savings, missing networks, shelter, health etc. Moreover, these disadvantages are likely to have a cumulative effect i.e. interacting in such a way that they compound the difficulties faced by the individuals. Many of those individuals do also not only belong to one of the above target groups but meet the characteristics of two or more. The eventual target group of the social inclusion component of AlbVET are individuals – and in particular young ones – who experience systematic and multiple disadvantages in their social and economic life’s. For various reasons they fail to fit within the broader VET systems and labour market structures more systematically than the majority of the population. Looking at who is mostly affected, many of these individuals belong to specific sub-groups characterized by broad socio-demographic characteristics. 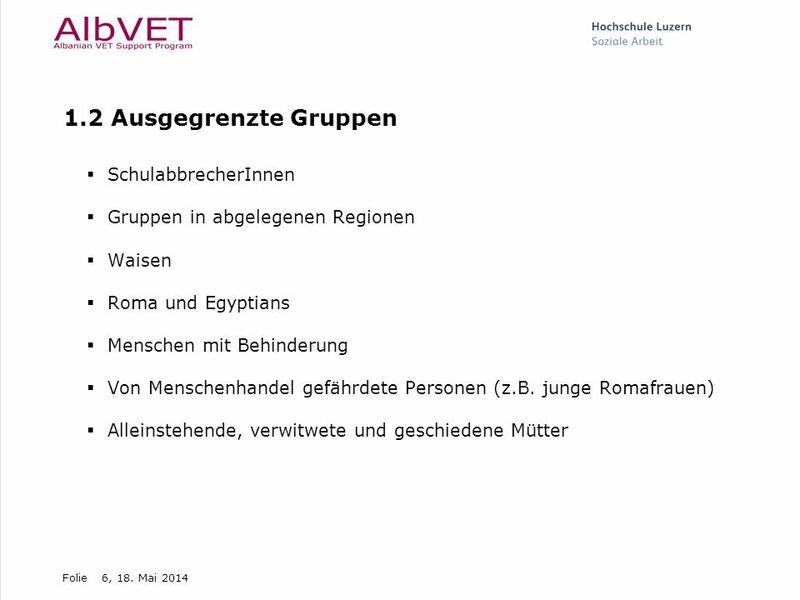 Gruppen in abgelegenen Regionen Waisen Roma und Egyptians Menschen mit Behinderung Von Menschenhandel gefährdete Personen (z.B. junge Romafrauen) Alleinstehende, verwitwete und geschiedene Mütter In recent years Albania has moved considerable steps forwards in acknowledging the importance of social protection and inclusion with a specific focus on special need groups. On the one hand Albania has signed and ratified most of the major international human rights treaties. On an international level, this obliges Albania to take the necessary measures to ensure compliance with these treaties including adaptation of its national legislation and setting up of appropriate monitoring mechanisms. In particular this includes the International Covenant on Economic, social and Cultural Rights (CESCR), the International Covenant on Civil and Political Rights (CCPR), the International Convention on the Elimination of All Forms of Racial Discrimination (CERD) and the Convention on the Elimination of All Forms of Discrimination against Women (CEDAW). Groups whose individuals are most likely to miss out on VET in Albania include school drop outs, school leaving youth, people from remote areas, orphans, Roma and Egyptians, people with disabilities, trafficked people and people at risk of being trafficked as well as women in vulnerable situation such as single mothers, divorced women and widows. As mentioned above, individuals from those groups often face multiple disadvantages in various issues. Those issues can among others be related to education, income, savings, missing networks, shelter, health etc. Moreover, these disadvantages are likely to have a cumulative effect i.e. interacting in such a way that they compound the difficulties faced by the individuals. Many of those individuals do also not only belong to one of the above target groups but meet the characteristics of two or more. The eventual target group of the social inclusion component of AlbVET are individuals – and in particular young ones – who experience systematic and multiple disadvantages in their social and economic life’s. For various reasons they fail to fit within the broader VET systems and labour market structures more systematically than the majority of the population. Looking at who is mostly affected, many of these individuals belong to specific sub-groups characterized by broad socio-demographic characteristics. Der Ansatz des Coaching-Cycle’ versucht zum herkömmlichen albanischen Berufsbildungsverständnis einen alternativen Ansatz aufzuzeigen, der methodisch sehr gemeinwesenorientiert ist. Hauptziele: Integration in die Arbeitswelt überhaupt ermöglichen Individulle und innovative Wege ausprobieren Entwickeln von eigenen Geschäftsideen Sehr prozessorientiertes Arbeiten. Selbstmotivation ist eine Voraussetzung um erfolgreich seinen eigenen Weg zu suchen. Arbeit in Gruppen und individuelles Begleiten sowie Zusammenarbeit mit den betroffenen Akteuren. Based on the above background AlbVET and the Lucerne University of Applied Sciences and Arts have developed a coaching cycle approach. This approach serves as a basis for the intervention within the social inclusion component of AlbVET as well as for further discussions of the topic “employability of vulnerable individuals” . 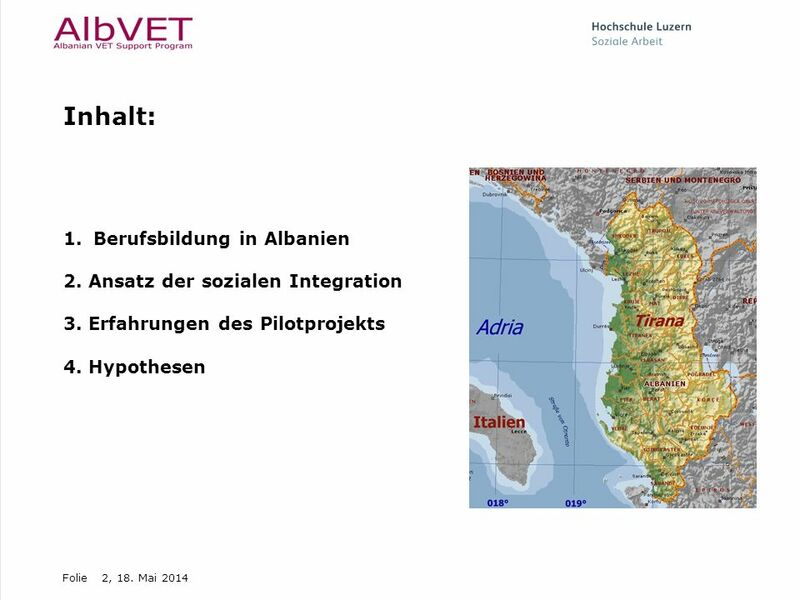 The Approach tries to be an alternative to conventional albanian VET programs and includes priciples and methods of Community development, delivered by the University of Lucerne. The main goal of the coaching cycle approach is to increase the employability of (young) vulnerable individuals by supporting them to be integrated in the labour market, be it through employment or self-employment. New about the Approach is, that it focuses on the group of participants as learning and experimental environment. The participants develop skills and competences within the group accompanied by trained coaches. This way of process-oriented group work is little known in Albania. The coaching cycle approach builds on the individual’s self-motivation and self-initiative. Self-motivation is considered to be the crucial pre-condition for a successful process of personal development. However, it is acknowledged that many young people need to develop self-confidence and self-awareness to develop personal goals and motivation. The coaching cycle approach is applying the individual characteristics perspective. To avoid falling into the trap of treating the target group as a largely homogenous group specific steps and measures are defined and adapted for each individual during the process. Overall, the coaching cycle approach needs to be understood as an approach bringing together the two elements of working in groups, the collective and individual support and accompaniment of the individuals and coordination with and between relevant stakeholders. Selbst- und Sozialkompetenzen entwickeln (Z.B Gruppenarbeit, Konfliktlösungsstrategien, Motivation, Offenheit und Höflichkeit, Teamfähigkeit etc.) Entdecken der Arbeitwelt und der Berufsbildung Die Teilnehmenden entwickeln eigene realistische Vorstellungen und skizzieren ihren Weg, um in die Arbeitswelt einzusteigen. Individuelles Begleiten Die Teilnehmenden entwickeln mit den Coaches einen persönlichen Entwicklungsplan. Schnupperlehren und Praktika Sie erleben erste Berufserfahrungen in der Arbeitswelt. Sie entdecken unterschiedliche Berufsrealitäten- und Felder mit allen Anforderungen, Möglichkeiten und Grenzen. Projektarbeit Die Teilnehmenden entwickeln in Kleingruppen eine eigene Projektidee. The coaching cycle is the main element of the coaching cycle approach and describes the process along which the individuals are supported by a coach. The coaching cycle itself is then divided into joint modules within the group of participants and individual elements such as specific occupational trainings, internships and other activities. Working and Learning in Groups Develop social and self competences (e. g. working in groups, presentation and conflict resolution skills, motivation, cordiality, team work ability etc.) Exploring labour market and education The participants develop an idea about their own situation and working possibilities in Albania. The participants discover their interests in professions and develop realistic ideas about requirements and chances on the labour market. Individual Coaching Based on their interest the participants develop together with the coaches personal goals and an individual development plan, how to reach the goals within the coaching cycle and in the time beyond. Short and long term internships Short and long term internships are first steps into the labour market which allow the participants to explore a professional activity and become self-aware of their strengths, weaknesses and interests. The cooperation with local businesses might open doors for further employment. Internships can also be the basis to develop an own business idea. Project work The participants develop as a group a small project in the community. The project is part of the development of teamwork, planning and organisational competences. It also helps to include the community into the coaching cycle. 10 2.3 Die Coaches ausbilden Die Ausbildung wurde durch AlbVet (swisscontact), den lokalen NGO’s und der Hochschule Luzern entwickelt. Die Coaches sind Mitarbeitende von lokalen Organisationen, welche alle mit diesen Randgruppen arbeiten. 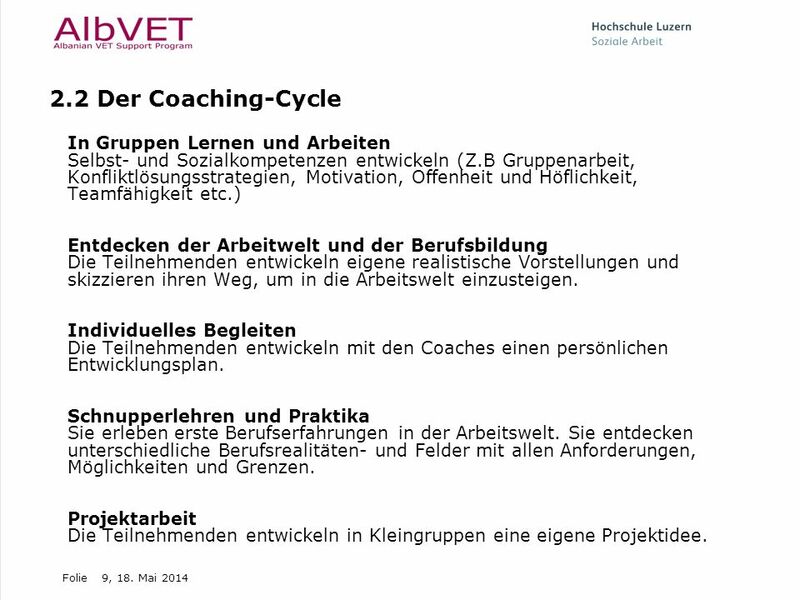 Die Ausbildung der Coaches behinhaltet die gleichen Module wie der Coaching-Cycle, jedoch drei Monate im voraus. Die Umsetzung des Programms wird unmittelbar in Zusammenarbeit mit den Coaches überprüft und wenn nötig angepasst. Jeder Ausbildungsblock wird nach der Umsetzungsphase überprüft, die Erfahrungen werden ausgetauscht, Optimierungen diskutiert und neue Massnahmen getroffen. Training of Coaches A market relevant professional profile and curriculum for coaches is developed and the training of at least 10 coaches implemented. The training is provided by AlbVet and the Lucerne University of Applied Sciences and Arts together with local partners. The coaches are recruited through local organizations, institutions or projects working with and for the concerned target groups. This includes in particular NGO working with Roma / Egyptian minorities, people with disabilities, vulnerable women and other very poor groups of the Albanian society. The Coaches work in the same Modules as the beneficiaries, but three months in advance. The coaches experienced for example rules of working in groups and group dynamics within their own training. This allowed them to reflect on their own experience and develop concepts how to work with the group of beneficiaries. 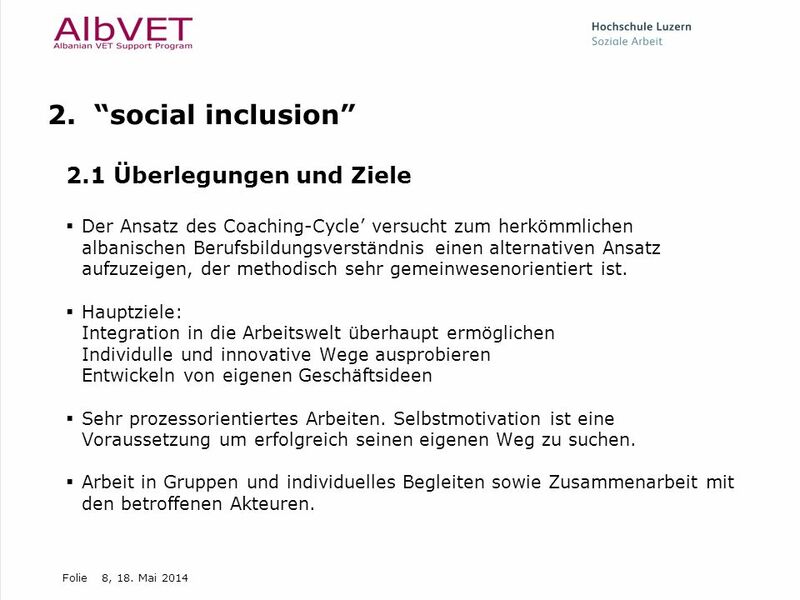 The contents and sequence of the coaching cycle is developed by AlbVet and Lucerne University, but always discussed and agreed on with the coaches. Sharing experiences and mutual support is an important component of the training of coaches. Reflecting on the experiences made working with the beneficiaries, the coaches continuously cooperate with AlbVet and the Lucerne University in order to further develop the project. 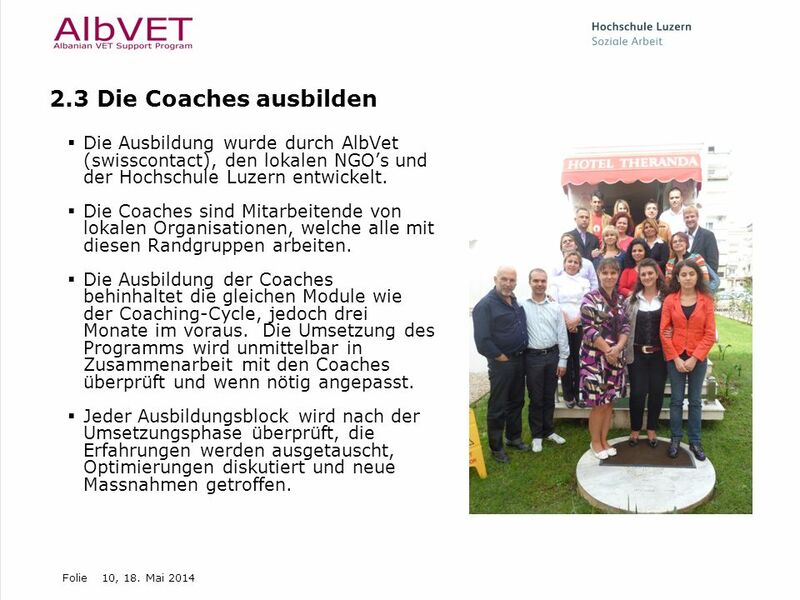 400 Teilnehmende in 10 Städten 40 Coaches von 15 lokalen NGO’s Projektstart AdressatInnen: Januar 2011 Ende des ersten Coaching-Cycles: Juni 2012 Start des zweiten Runde Juli 2012 The coaches, their role and capacities are crucial for successful coaching cycles. Currently we are working with 15 coaches from 4 local NGOs that work in 7 cities (Tirana, Elbasan, Berat, Lezha, Korça, Morawa and Kuçova) with a total of 88 beneficiaries. 1 NGO is a Roma NGO and 4 Coaches belon g to the Roma Community. The other NGOs work with Roma or Egyptian or disabled people. The coaches themselves are working as part of an organization or project which works with and for a concerned target group. Through this institutionalization it can be ensured that on the one hand the coach already has a good connection to the target group respectively works in an environment with this access, on the other hand synergies with other activities of the organization can be created. The work as a coach is highly challenging, it requires committed and initiative personalities. However, peer coaching and learning between the coaches shall be enhanced through learning tandems or groups supporting each other through exchanges of experiences, constructive feedbacks and new ideas. The structures at the coaches level therefore looks as in the shown graphic. 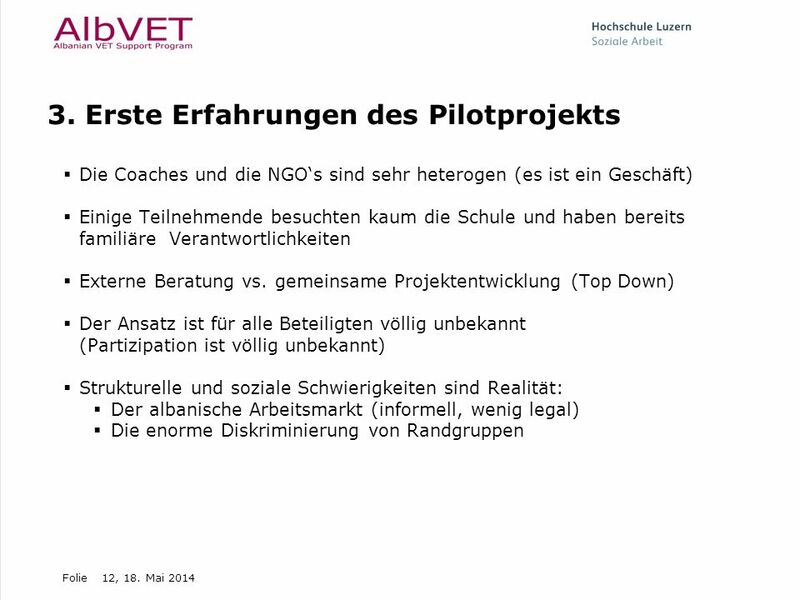 Die Coaches und die NGO‘s sind sehr heterogen (es ist ein Geschäft) Einige Teilnehmende besuchten kaum die Schule und haben bereits familiäre Verantwortlichkeiten Externe Beratung vs. gemeinsame Projektentwicklung (Top Down) Der Ansatz ist für alle Beteiligten völlig unbekannt (Partizipation ist völlig unbekannt) Strukturelle und soziale Schwierigkeiten sind Realität: Der albanische Arbeitsmarkt (informell, wenig legal) Die enorme Diskriminierung von Randgruppen The group of coaches is itself very heterogeneous. It has been a challenge to meet the different backgrounds, educational levels and professional backgrounds during the trainings. The focus of the project is on a joint development of the project together with the coaches and the NGOs since they provide knowledge about and access to the target groups. Since the beginning we had to strengthen a common understanding of all stakeholders on the goals and the approach of the project. Agreements on collaboration had to be made and a joint adaptation of the project to the local circumstances in Albania. Some of the beneficiaries have a very low educational level. This makes the access to VET courses and internships more difficult. Besides the Coaching Cycle many of the beneficiaries carry responsabilities for their own families and need to guarantee a family income. This makes working with them for two days per week challenging. During the first implementation most of the groups have been attracted to the conventional vocational training center courses that are most of the time too short in duration. In some of the regions there are active state or private Vocational Education Training providers. It is difficult to find the balance between identifying new ways of training and give time for a process and the expectations of the beneficiaries to quickly gain a certificate for the labour market. For most of the beneficiaries it is difficult and new to develop short, mid-term and long-term goals for an individual development due to their daily struggle to make a living. The coaches needed time to understand and trust the new approach in order to lead the process with the beneficiaries. The idea of the young people gaining first-hand insights into a profession by working a short period of time in a company, before choosing an education or profession is not known in Albania. During the process we have noticed that in case you are not part of the family or circle of friends of a family who owns a business, it is very hard to be employed in most of the companies or shops in Albania. Another reason for not employing young people is, that many businesses are not registered. 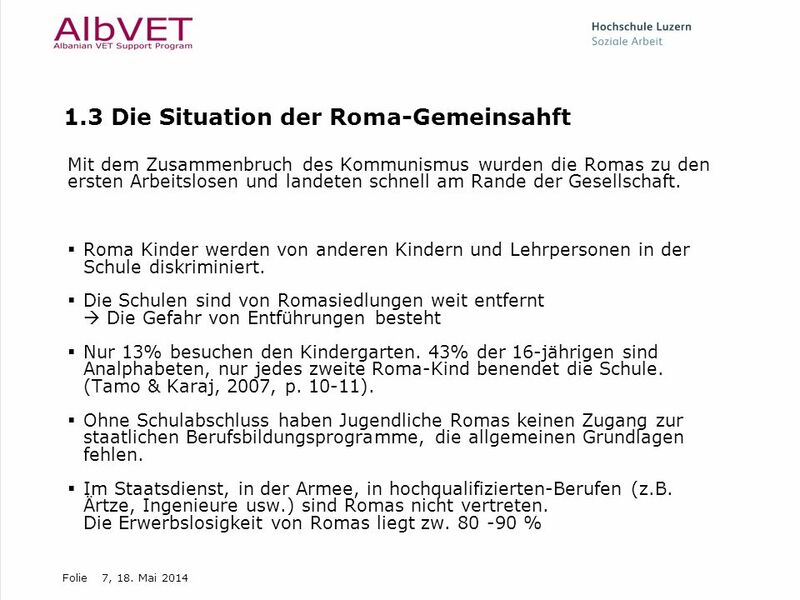 The discrimination of Roma in Albania is also a difficulty for the project. Looking for employment possibilities or short internships the coaches are confronted with various stereotypes concerning Roma people (e. g. lack of punctuality, laziness etc.). Our experience shows, that it is possible to integrate the beneficiaries in VET programs or Internships, but it requires a lot of energy and continous trust building contact to local businesses by the coaches and the benficiaries. 13 4. Hypothesen Wir sind nicht in der Lage die sozialen, politischen und ökonomischen Realitäten zu verändern, aber wir können die Coaches und die Teilnehmenden motivieren neue Wege auszuprobieren. Wir entwickeln „Selbstvertrauen“. Das Projekt bekämpft auf lokaler Ebene Ausschlussmechanismen und knüpft unter den betroffenen Gruppen und der lokalen Arbeitswelt Beziehungen. Da Erwerbslosigkeit in Albanien weitverbreitet ist, sollten wir im Projekt vermehrt auf self-employment setzen. 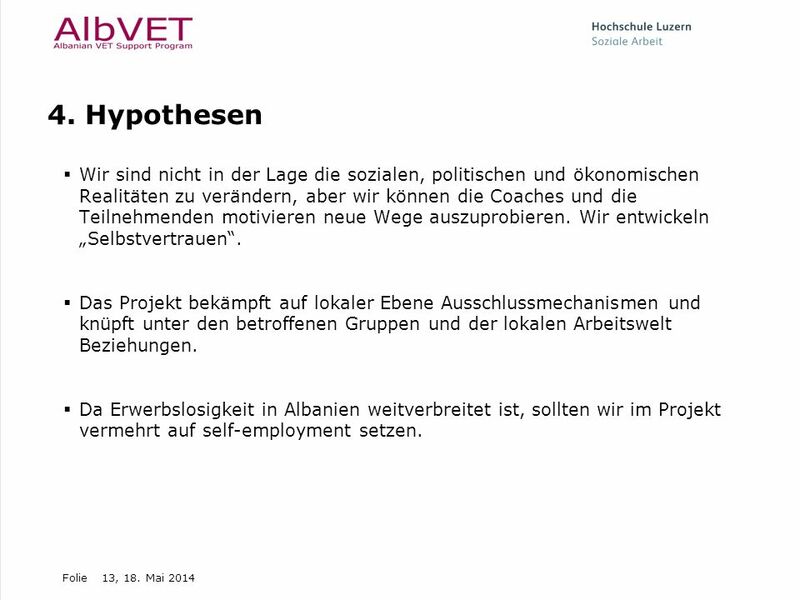 Herunterladen ppt "Arbeit mit Randgruppen in Albanien Coaging for Employment"